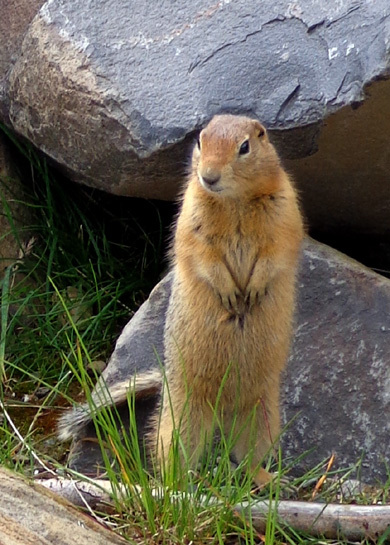 ACTIVITIES IN THE "FRONT COUNTRY"
of being eaten, a ground squirrel is always alert and quick on its feet." Remember the photos of the two cute little ground squirrels I showed in the last entry about my hikes above and below the Eielson Visitor Center? 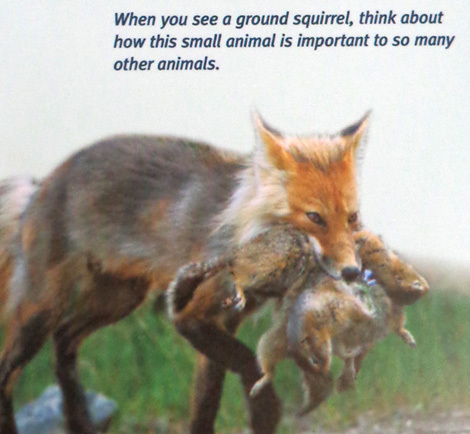 It came as a bit of a shock to me to read this the next day and see the accompanying photo, shown below, of a fox carrying its next meal(s). I know the wilderness is one big food chain but this description and photo are so graphic . . .
Jim's likely response? "Foxes gotta eat, too." He's right. One of the philosophies of the park in recent decades has been to maintain a neutral stance regarding predators and prey in its ecosystem. 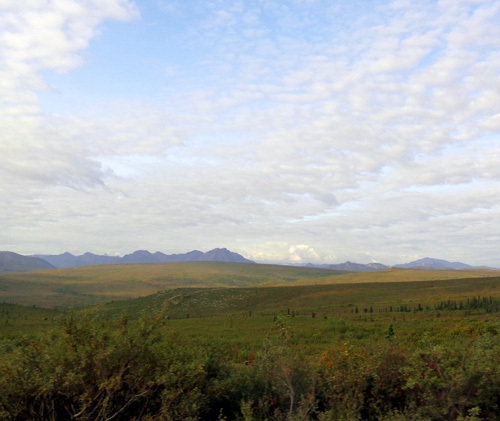 At Denali relationships between the "hunters" and the "hunted" play out with minimal human interference. Weak and diseased animals are culled out naturally that way, helping each species -- whether predator or prey -- stay healthier. This was another perfect weather day at Denali National Park, at least in the areas where we were � mostly sunny, with temperatures ranging from the mid-40s to upper 60s F.
There was no road work on Sunday but the paved road is still rough between Savage River (Mile 15) and the �front country.� Savage River is as far as private vehicles are usually allowed to travel. Traffic was very light going eastbound, our direction. There was only one RV behind us and no buses. The only large wildlife we saw = two caribou grazing in a meadow; I deleted the photos because they were too far away to see clearly even with 16X zoom. Note to self: get a camera with a big ole long lens before we visit Alaska again . 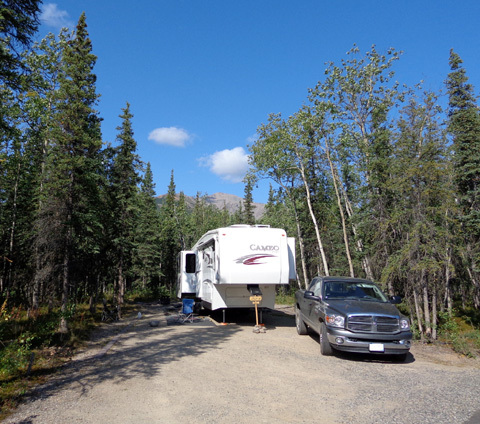 . .
We drove into the Bear Loop at Riley Creek Campground first to claim an "A" site (A = for longer campers, B = for shorter ones), then went back to the water/dump station. Several sites with people due to leave today were still occupied when we arrived at 9:15 AM but we found a very good one at the far end of the loop that was easy for Jim to back into. It�s a double site near the one we had earlier last week. After we got set up Jim did two loads of laundry at the nearby Mercantile; he did two more in the mid-afternoon. There are only four washers and dryers, which isn�t nearly enough for all the campgrounds and backpackers who use this park. He was lucky to get the machines when he wanted them. Thank goodness it was sunny and most people were out enjoying the park instead of doing laundry! We both had enough exercise yesterday that we needed more of a rest day today. 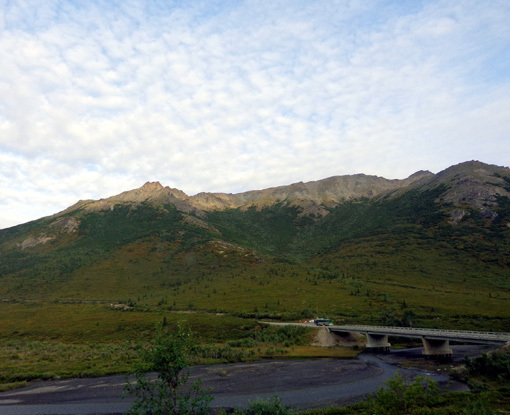 While Jim was doing laundry in the morning I went to Nenana Canyon AKA "Glitter Gulch" to hunt for a Denali shirt and/or jacket. The Canyon is located near the entrance to the park. 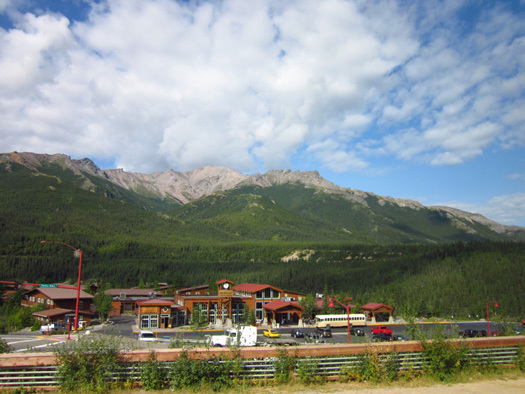 It's a $$$ trap with a variety of shops, recreation outfitters, and accommodations, mostly overpriced because of the area's isolated location near a popular tourist destination. I found a reasonably priced, long sleeved black t-shirt with a subtle embroidered design of the mountain on it but I haven�t made up my mind which jacket I want. 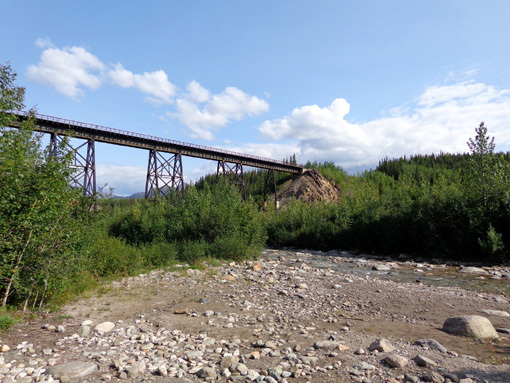 Healy Ridge towers over one of the lodging options in Nenana Canyon. I also got milk, which is as outrageously priced around here as bread. I paid $5.09 for a half gallon of skim milk; another store was $5.29. Whole wheat bread is over $8 a loaf for what costs less than $4 in a grocery store in Anchorage (or $3 in the Lower 48). In the afternoon I walked 3+ miles to and from the visitor center on the McKinley Station Trail, which goes down to Riley Creek. There is a trailhead a few feet from our campsite. I enjoyed this trail when we were here last week and wanted to hike on it again. 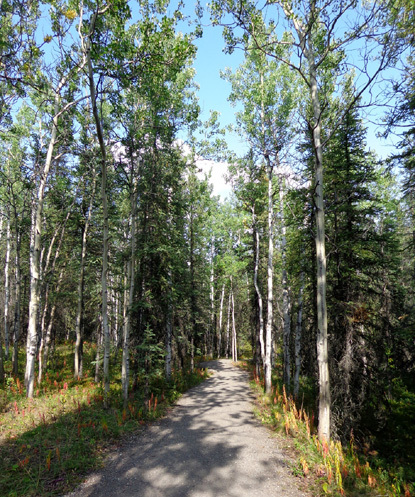 Passing through a spruce and aspen forest and along Riley Creek, it's a more pleasant and remote walk than the paved bike path connecting the campground to the visitor center. 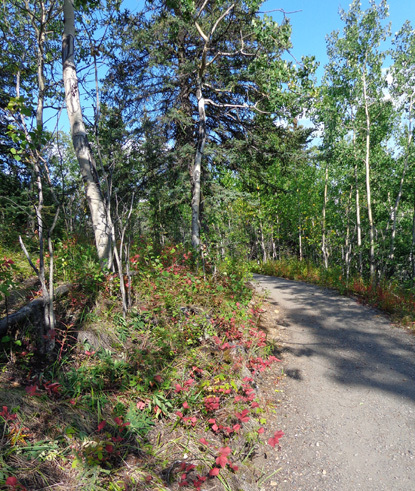 Rangers offer a 2-hour McKinley Station Walk each day from 1 PM at the main visitor center. 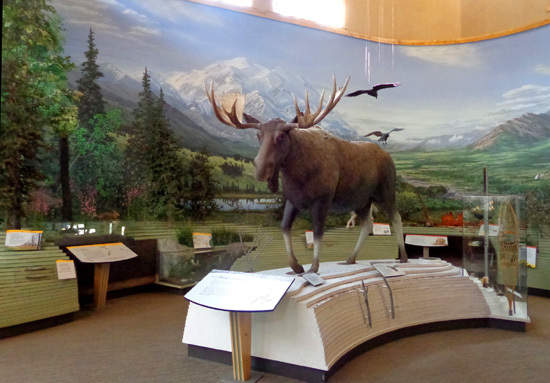 No sign-up is required; just meet the ranger group at the visitor center. I haven't joined a group yet but I've seen one at one of the historical sites along the route while hiking on my own. 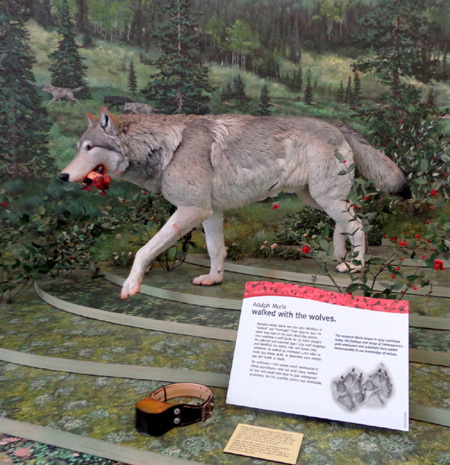 The trail passes through an area with historic pioneer artifacts and "remnants of habitation," as the park web page describes it. 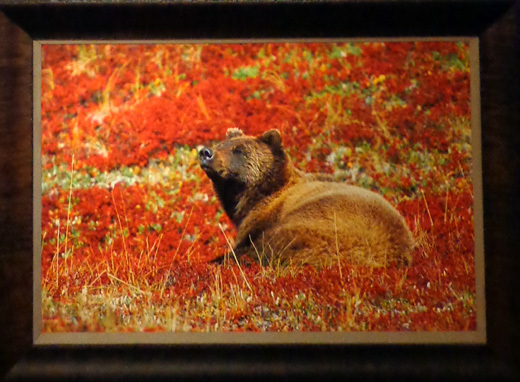 I was drawn to the theater to watch the 18-minute film �Heartbeats of Denali� again. Even the second time watching it I got goose bumps from the images and music, so I bought the DVD at the Alaska Geographic bookstore next door. 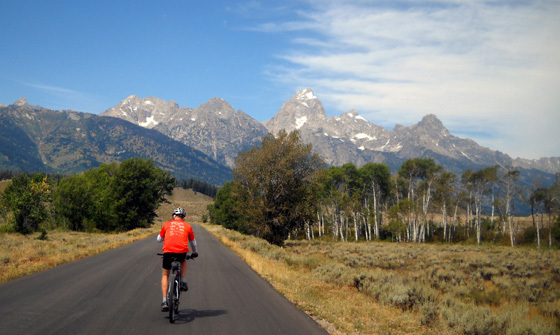 It�s only $9.95 and has two versions of the video � the one with very little verbiage that�s shown at the visitor center every half hour, and a longer narrated version. I�ll enjoy watching it on my computer or the TV when I want to be inspired or just reminisce about this great trip. You might want to order a copy ahead of time if you're planning your first trip to the park. In the evening Jim went to the nearby amphitheater to hear the bear talk with Ranger Katie. 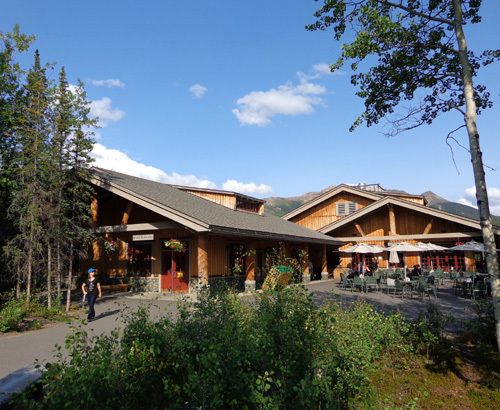 He said it�s the best of the three ranger talks he�s attended at Denali so far. fall. 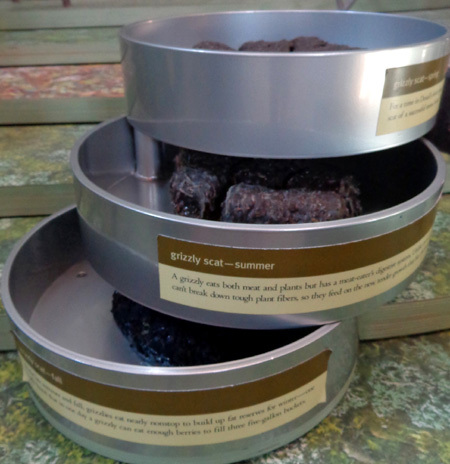 Bears' diets change during the seasons, depending on what's available to eat. I walked Cody around the campground instead of going to the ranger talk, and got online to catch up on e-mail and news. 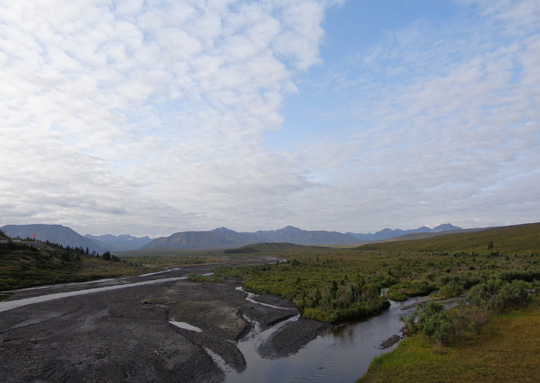 It�s good to be "connected" again -- we had no internet or phone reception at Teklanika River for four days. Life is more peaceful that way but we kept wondering what was going on in the world. Jim came up with a great idea about 10:15 PM -- staying even longer at the park. We love it here and keep thinking of more things to do. 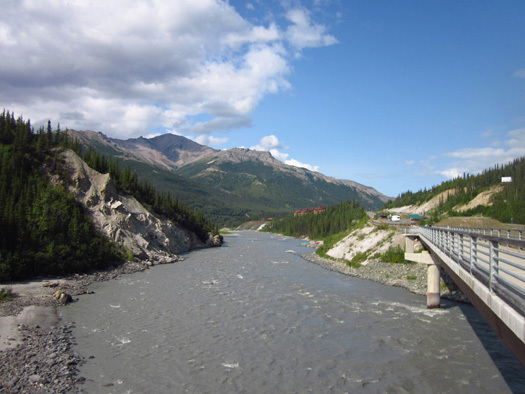 Our itinerary is as fluid in Alaska as it is most everywhere else we travel. Last week we added two days onto our original eight-day stay. We know how fast the larger �A� sites fill up and didn�t know if we could extend for even one more day. The Riley Mercantile is open till 11 PM so Jim walked over right away before they closed. We lucked out; he got one of the last �A� sites for Wednesday night. We can remain in the same campsite till Thursday morning. Yay!! !